Our concrete stains and specialty coatings have been proven since 1989 by industry professionals to restore, improve durability and enhance the image of concrete. RestoraCrete was founded on the belief that decorative concrete should be convenient and affordable. Need a concrete floor stain, sealer, or polished concrete floor? Whether you are specifying or installing decorative concrete RestoraCrete has a high-quality solution for you! To get started on a new project, the concrete must be cleaned & prepped. 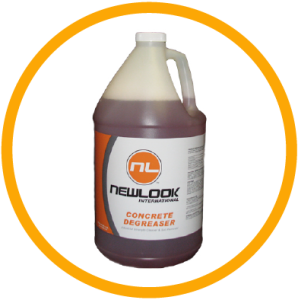 RestoraCrete Supply offers a number of products that help clean, strip, degrease, etch and remove efflorescence from concrete. Many of the cleaners are safe for the environment and biodegradable. Creating beautiful concrete means using amazing decorative concrete restoration products, such as the ORIGINAL Solid Color Stain (image). RestoraCrete is known to supply the most innovative stains used to make ugly concrete look brand spanking new! The latest innovations from our #1 supplier, NewLook Labs, Endura Solid Stain & Endura Faux Fusion are highly durable and easy to use, single component concrete stains. To get started on a new project, the concrete must be cleaned & prepped. 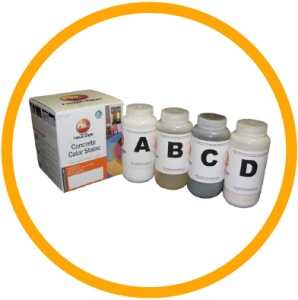 RestoraCrete offers a number of products that help clean, strip, degrease, etch and remove efflorescence from concrete. Many of the cleaners are safe for the environment and biodegradable.